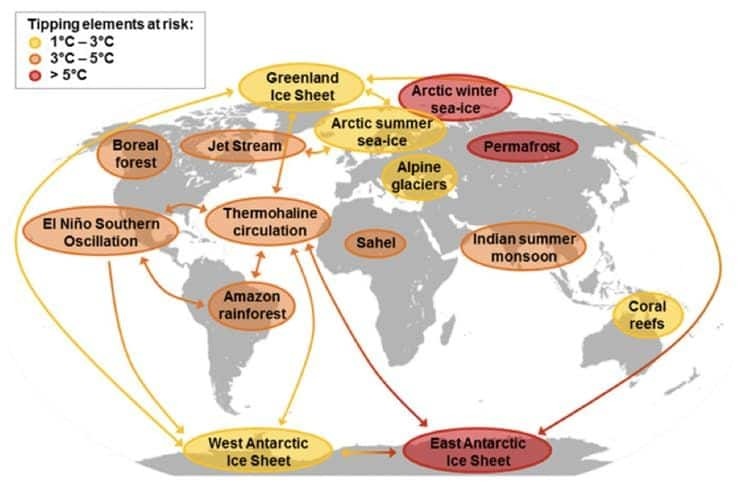 Perhaps of all the tipping points depicted on the below graphic I am most familiar with today’s subject since I was a meteorologist long before getting interested in climate change. I first began staring at 250 and 500 millibar charts, those at jet stream level, at Florida State in the meteorology chart room in 1981 trying to recognize and memorize different patterns for weather forecasting. Those of us coming out of school during the 1980s were just beginning to get trained in using automated, computer generated models, which weren’t that great at the time at forecasting jet stream pattern changes. Our bread and butter was manually “outguessing” these models. The best of the crop of forecasters coming out of met schools during that decade memorized 500 millibar patterns like true baseball fans memorized stats on individual player cards, becoming fanatics when it came to the game of outforecasting computer models. As an aside, computer models have gotten so good since about 2010 that automation has taken over the generation of day to day forecasts. Companies like The Weather Channel no longer want or require large complements of meteorologists to forecast, only employing mets to intervene with automated systems when, for example, micro to mesoscale outflow boundaries induce thunderstorm activity that sophisticated computer models don’t catch. Even so, with greater advanced computer power runs of models can be processed in as little time as fifteen minutes apart catching and correcting short term errors. Forecasting is truly becoming a dying art, per se, because of automation. Now we are reduced to creating graphics for on air purposes, or for those who have the gift of gab, presenting forecasts on T.V. As Stu Ostro and others had seen since 2000, more warm air at 500 mb was encroaching upon polar areas forcing the jet to undulate more wildly than in the past, pinching off at times to form fairly strong storms. During winter snowstorms occasionally pummeled areas such as southern China from these closed lows forming south of strong ridges, which denialists often pointed to as evidence of no real climate change. All the while global surface average temperatures continued a persistent warming trend. Buckling of the jet, though, is another method for nature to cool the planet. 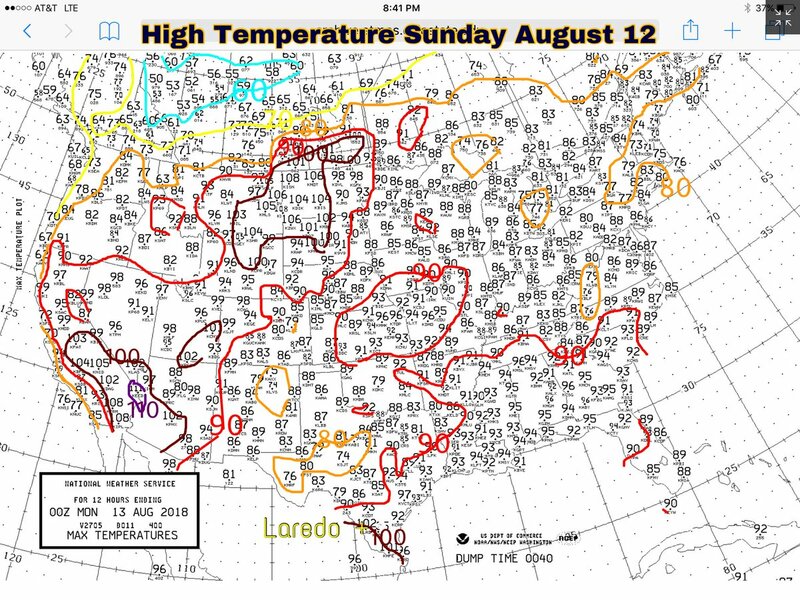 Understand that the jet has buckled for thousands of years bringing cold air southward to cool mid latitudes, otherwise places like Dallas, Texas would be too hot to live in during the summer. Referring back to Will Steffen and company’s chart the jet stream is forecast to have its tipping point at +3.0 to + 5.0C above preindustrial conditions when it won’t be a cooling factor but will warm the planet. Their computers have used climate models to time when the polar vortex shrinks so much that it can’t undulate, redistributing cool air to mid latitudes. At above +3.0C there will be less not more closed lows or storms, which are symptomatic of change now. The jet will trap any residual cool polar air rather than redistribute the stuff southward, becoming a net warming factor for the planet. Or will it? 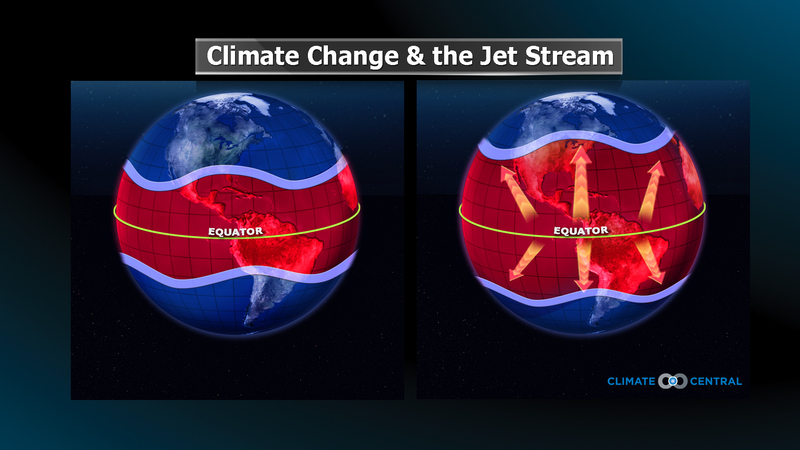 Perhaps the jet keeps heat from accumulating in the tropics, but atmospheric mixing may do this anyway. Perhaps having a jet or core of high winds aloft is a neutral factor. I can envision a small 576 decameter line on a 500 millibar chart encircling the Arctic where the jet is stuck in the future. Perhaps it may get so warm that this height line of relatively lower heights is much higher at say around 588 decameters with huge 600+ decameter ridges over continents to the south creating a hellish world. Exactly at what average surface temperature this occurs around +3.0C is unknown. If we as a species keep this temperature below +2.0C I hope we never find out. Unfortunately heat will start increasing again from California into the Pacific Northwest. No, we are not definitely (or even probably) headed toward a hothouse apocalypse. It’s a literature review / opinion piece. Many scientists I reached out to still found its ideas compelling. New record highs set on Sunday! 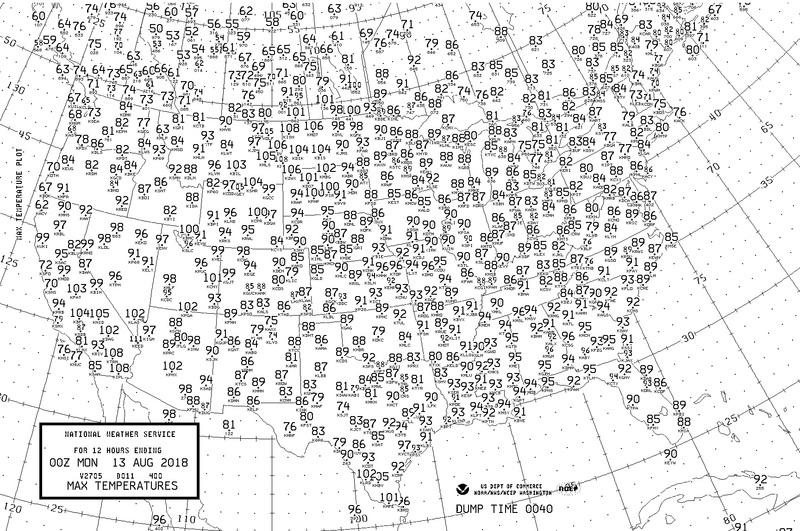 The 108 F recorded in Williston ties the record high temp for August in Williston, set on August 7 in 1949! 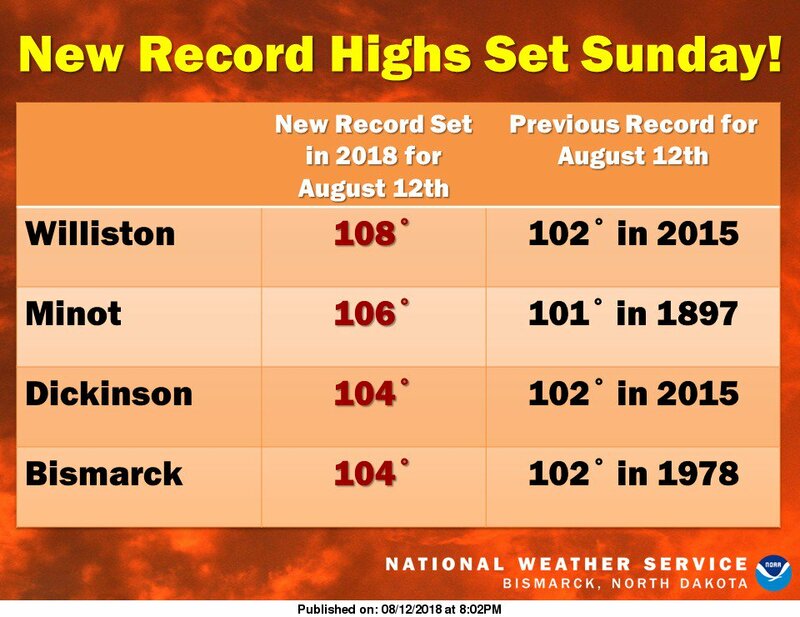 Record heat was confined to North Dakota. 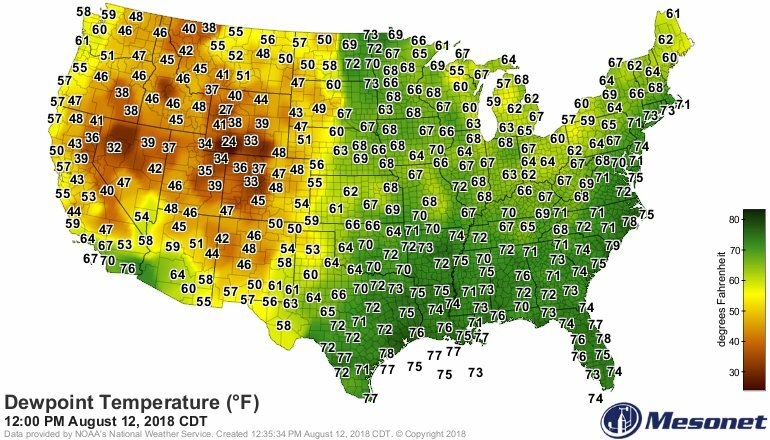 Most of the West had above average temperatures while the eastern half of the nation had typical readings for mid August.